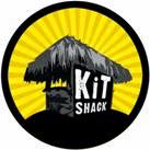 A shorter than usual blog this week (hooray I hear you say) as I’m off to Thailand for three weeks tomorrow and I still have packing to do! I also thought I’d try out a slightly new format for the match report, let me know what you think. On arriving, Glynn Wickham said the match had been switched from Sellicks to Longs which I wasn’t too upset about as I haven’t fished it for ages. 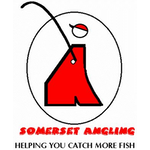 There was a good turnout of 20 anglers including Tom Mangnall and Bob Gullick who I hadn’t seen for ages. 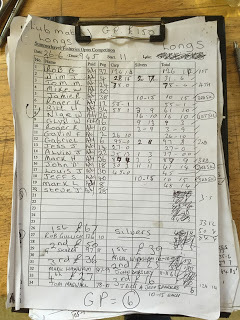 Adie announced the draw and after the initial rush died down, I pulled out a ping pong ball which had the number 38 on it, which put me right in front the car park, I’ve only drawn it once and managed second in the silvers on a hard day with 5lb 15oz. My neighbours for the day were Jeff Sparks on peg 40 and Mark Hanham on peg 36 as Adie had but every other swim in. I set up a 10 x 11 MW F1 Slim for fishing at 8.5 metres straight out and 10 metres to the left and right and a 0.3 gram NG Mini Gimp for the 5 metre line. The view from peg 38 looking up towards peg 2. The whistle went and I fed all four lines with half a pot of micros before starting straight out in front with a 4mm Bait-Tech Xpand pellet on the hook. The rig settled and it wasn’t long before the orange tip disappeared and I netted a small skimmer to get me off the mark, I had another and then next put in, the float moved along the surface as a fish took the pellet on the drop and I struck only to bump what felt like a better fish but when I shipped back the hooklength had snapped! After putting on a new hooklength I had a couple more blades before hooking a decent fish which turned out to be a nice crucian. Jeff was getting some small fish and then had a big flying skimmer, I had one around a pound and a few minutes later added a second. Not long after I hooked a third only for it to come off as I shipped back and I hoped it hadn’t spooked them. I ended a good first hour with 11 fish for probably 3.5lb. I was still catching quite a few small skimmers between 1-3oz but as I’d feared those bigger ones had gone. 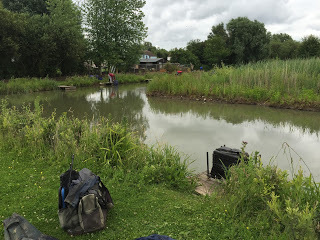 I cupped in some more feed on the two 10 metre lines with a view to trying them shortly and when I foulhooked a carp on the 8.5 metre line, it made my mind up to rest that line for a bit. I had a few more small skimbobs off both the longer lines but still no bigger fish and I probably only added around a dozen small fish for 1.5lb by the end of the second sixty minutes. I hooked a carp on the left hand 10 metre line and it led me a merry dance before snagging me on a root on the inside, I managed to get the float back but the rig was trashed and it took me a while to get set up again and despite it being an identical rig, as is very often the case, it just wasn’t the same. Jeff had a couple more decent skimmers and I felt he’d edged ahead. Things went from bad to worse when I hooked a decent fish on the 8.5 metre line and it didn’t feel like a carp, the hook pulled out and there was thick dark slime on the hooklength so I’m pretty sure it was a tench and I really needed that one to stay in touch with Jeff. I had a quick look on the 5 metre line where I’d been dripping some micros in every time I shipped out but a small skimmer and two lost carp wasn’t the result I’d hoped for. I tried the three longer lines again but only added a few more small skimbobs and a 4oz roach, Jeff said he was now struggling for bites. I came back on the shorter line and the next bite resulted in a big skimmer flying out of the water, I safely netted it and at 2lb plus, it probably put me on around 8-9lb. I just needed a good last hour now. It started well with another decent skimmer but it proved to be a false dawn and just added some more smaller skimmers and had another nuisance carp just before the all out. I ended up with 60 fish plus a few carp which I didn’t count. Jeff said he thought it would be close between us, he’d had more of the better stamp skimmers but I had a lot more fish. We’d soon find out as Adie arrived with the scales along with Ray Wickham (who hadn’t fished today) on weigh board duty. I chucked my carp back and then my silvers went 10lb 15oz, Jeff pulled his net out and he was right, it was close, in fact there was nothing to separate us as Adie called his weight at 10lb 15oz too! As we loaded the cars, Nigel Wickham turned up and was admitting to 10lb of silvers so I knew he’d probably beaten us and apparently Glynn had around 8lb so that could be touch and go as well. Jeff also said he thought John Dursley might be a dark horse on peg 18. Gabe Skarba was on peg 6 which was also the golden peg and when he weighed 97lb 8oz he was in with a shout of a bumper payday. Glynn weighed 9lb 13oz on peg 16 and then Jeff had been right about John D as he weighed 11lb 11oz to go into the silvers lead. Tom Mangnall had 78lb of carp from peg 24 and then Nigel had 16lb 10oz of silvers. Bobby Gullick on peg 32 said he’d had 57 carp but they were only small, averaging a pound apiece but he actually weighed 126lb 14oz (so not too far out with his estimate then!) and stopped Gabe from winning the golden peg. 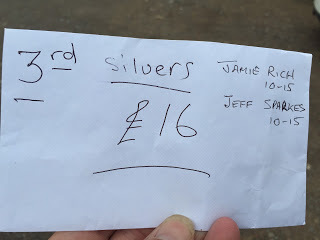 So Jeff and I ended up joint third in the silvers and had to share £16. 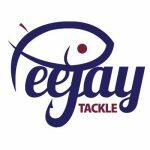 I’m off to Thailand for three weeks tomorrow so keep an eye on the blogs FB and Instagram pages where hopefully there’ll be some nice fish photos as I’m fishing another venue for the first time.